Although it has been a theme of science fiction since at least the 50’s, this year brings two films: Her and Transcendence along with the TV show Persons of Interest, with an artificial intelligence as a main character. (There are probably more out there. These were the first ones that came to mind.) 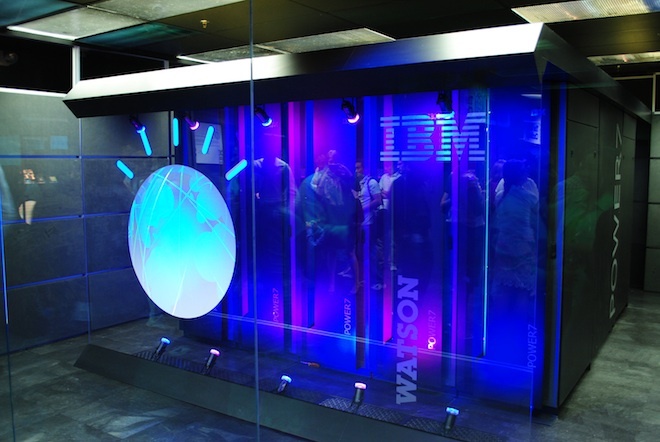 In real life, IBM have created a new division to open up access to Watson, their Jeopardy-playing artificial intelligence, so that developers can use its capacities to solve new problems, having already started addressing healthcare. They are just one of large range of companies and developers working on practical application of artificial intelligence at the moment. Given that an artificial intelligence, in the form of the data miner Tu, is a key character in Sea of Dreams, I find it interesting that there is a particular cultural focus on AI. It seems to me that the emerging Data Age will have some form of artificial intelligences that are capable of learning and adapting. The stories that we tell about these reflect our current hopes and fears. The future; however, seems to end up something slightly different. In general, SF has not been too kind to artificial intelligences. From HAL in 2001 to Skynet of the Terminator series to the machines of the Matrix, AI has been cast as the big bad wolf, often attempting to exterminate humanity in a contemptuous Darwinian survival of the fittest (Agent Smith’s monologue to Morpheus in The Matrix). It seems that AI’s are rarely seen as sympathetic, unless they are in a human form, like Dorian in Almost Human. The only sympathetic portrayal that comes to mind at the moment could be Wintermute in William Gibson’s Neuromancer, although it is not clear where the AI’s in Person of Interest sit on the good/bad spectrum. For Sea of Dreams, I wanted to get away from good/bad view of artificial intelligences. What I wanted to explore with the data miners, was their alienness, how they are unknowable to some extent because they do not share the same world and construction as we humans do. One aspect that I was particularly interested in was the concept of time. For the data miners, time is measured in milliseconds, therefore they do not work on human time. A whole digital world war can occur in the blink of an eye. Despite the differences, one thing that is similar between the data miners and humans is the fact that initial beliefs and ideas shape future actions, restricting the spectrum of possible responses to situations. The data miners, and all other artificial intelligences, are shaped by the initial objectives and assumptions they were programmed with… just like us. It is this initial framing that also leads to unexpected results if we are not aware of how those results came about.